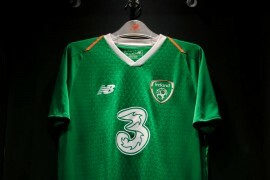 Nike have made a big deal over Ronaldo’s retirement from the beautiful game, with special kits available and even a commemorative video. 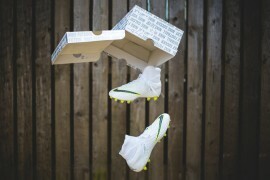 But it looks like they had one more surprise up their sleeves with some golden football boots! Revealed today when the Brazilian legend went to Nike HQ for a visit, Nike had prepared a special surprise for the man who had single-handedly changed the way we think about football boots. Described by the Nike staff as a ‘Golden Tribute’, these stunning Mercurials were a thank you to El Fenomeno from the big American brand for all his help developing their flagship range of lightweight football boots. 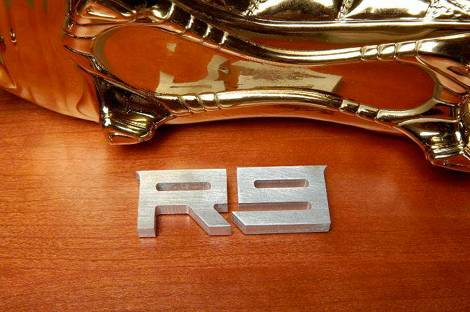 The former Inter, AC Milan, Real Madrid and Barcelona forward was presented them in a special wooden chest (not too dissimilar to the exclusive presentation packages received by his countrymen earlier in the week) with an ‘R9’ on the top in the same font that was used on the Mercurial range up until the Vapor IV. Modelled after the first R9 Mercurials that Ronaldo wore in the 1998 World Cup, Nike said the idea was to make Ronaldo’s ‘First Mercurials into his Last Mercurials’ that would last forever. 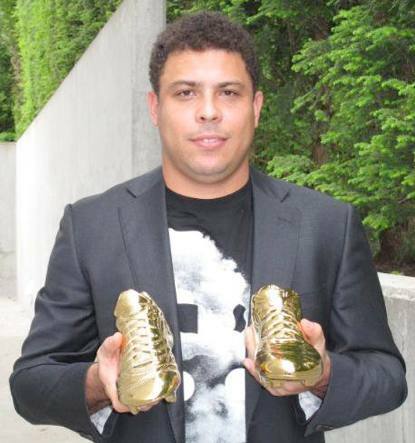 Ronaldo was a man who collected his fair share of ‘Golden Boot’ awards in his time on the pitch, but we reckon this pair are going to have a special place on his shelf! Meanwhile, Sakho’s Swarovski Superfly II’s now look a bit tacky by comparison. What’s that? They already did? His double chin… no, just… no. 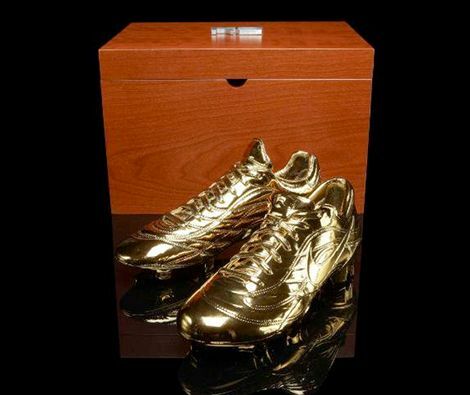 Wonder how much those cleats cost and whether they are real gold. I doubt it. Thoroughly deserved!!! The one and only R9!!! They day he goes broke,he can save himself with this.